Adding this webpage to your home screen identifies it with this icon. 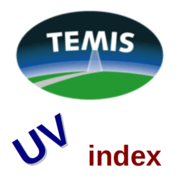 This tool returns the forecasts of the UV index and the total ozone column for the 0.25° by 0.25° grid cell that contains the user-specified location at local solar noon of today and the coming 5 days for clear-sky conditions and in the absence of snow. The forecasts are based on assimilated ozone data of GOME-2.